Oh Oreo you don’t look a day over 30! You are still just as you unique, delicious, and multi-layered as you were a century ago. What other cookie can boost dozens of ways to be enjoyed? Whether it be dunked in ice cold milk, disassembled, or mixed into a milkshake; you’ve still got it going on! In honor of your 100th birthday on Tuesday, March 6th, we’ve brought you a math and science lesson to do at home or at school with your little Cookie Monsters! 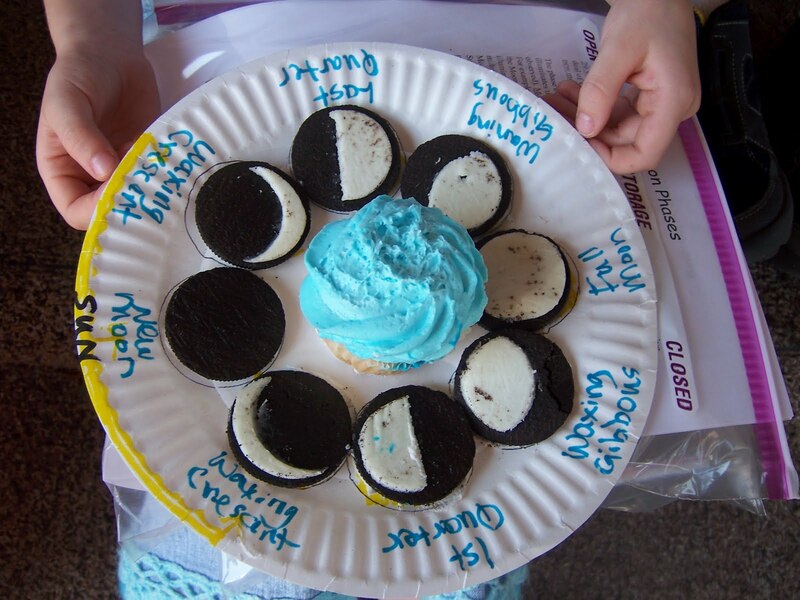 Young and old astronomers will enjoy learning about the moon’s phases using Oreos. For the little ones, start with the basics. Point out four of the moon’s phases using this printable during snack time. Give children two Oreos, a plastic spoon or knife, and let their inner Galileo shine! For preschool to young elementary age, children understanding the moon’s phases in a linear fashion is fine. This was Mack's first Oreo experience, and I'll just say he was "Over the moon!" If you want to take this concept to the older crowd, challenge them to make all eight of the moon’s phases in a circular orbit on a paper plate. Make sure they throw the Earth and Sun in their diagram too! Oreo cookies are great for teaching about circumference as well. Students can use a string, ruler, and of course an Oreo to understand the relationship between circumference and diameter. This might just tempt you to make an Oreo pi (wink, wink)! Find a printable of this lesson here. Oh and since the cutest Girl Scout, Mary Kate, delivered some scrumptious favorites (sorry Oreo, I love others too! )just the other day, I like to have my students compare the circumference of an Oreo to a Thin Mint. Sounds like all we do is eat around here. Don't worry, It's all in the name of learning!